Portable electric power quality analyzer that measures and records the data in compliance with the class A IEC-61000-4-30 Standard. Specially designed for outdoor measurements or in situations that require a highly accurate and very robust unit. 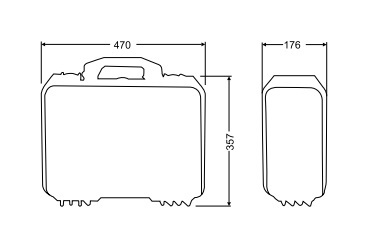 The QNA-P enclosure has an IP 67 degree of protection, which guarantees its robustness to strong impacts. The QNA-P analyzer has been tailor-made with clips and it has a wide range of flexible (LV measurements) and rigid clips (LV and MV Measurements). The internal switches can be adapted to any type of network (3/4 wires), with the use of its rigid (CP type) and flexible (C-FLEX type) clips. The QNA-P portable analyzer is highly versatile and can combine rigid and flexible nucleus clips. Its robustness makes it ideal for the intake of measurements in places subject to severe weather conditions. The unit has been specially designed for the execution of audits and revisions, since it has been certified as Class A, in compliance with the IEC-61000-4-30 Standard, so that the measurements taken can be used for any type of verification; a pattern element is used during the intake process. The internal GSM type can also be used to download the information remotely and draft a report with the data, even before removing the analyzer, which avoids the need of travelling to the installations. Saturn Pyro is an authorized distributor/reseller in Malaysia. Circutor QNA-P Portable Power Quality Analyzer / Portable Power Analyzer / Data Logger / Energy Logger Malaysia. Available in Penang, KL, Selangor, Johor & anywhere in Malaysia & Singapore.